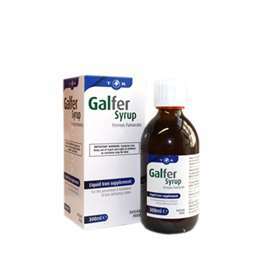 Galfer Syrup contains Ferrous Fumarate, a form of iron, which prevents low levels of iron and replaces iron in the blood due to simple anaemia. Galfer can therefore be used for the treatment and prevention of iron deficiency. For the prevention and treatment of iron deficiency states. Vitamin C and drinks containing citric acid may increase the amount of iron absorbed. Please read the label/leaflet enclosed. For prevention and treatment of Iron deficiencies take this medicine on an empty stomach if possible, if it upsets your stomach, take with or after food. Adults and Children over 12 years: Take two 5ml spoonfuls (10ml) once a day. Infants and children under 12 years are to seek medical advice. 45mg Elemental Iron (equivalent to 140mg Ferrous Fumarate). Sodium Methyl Parahydroxybenzoate (E219), Sodium Ethyl Parahydroxybenzoate (E215), Sodium Propyl Parahydroxybenzoate and Maltitol Liquid. Always read the label/leaflet enclosed. Keep out of reach and sight of children as overdose may be fatal. If symptoms don't improve after 28 days, consult your doctor. Prolonged use in children should be under medical supervision. Contains 10g of liquid maltitol per 10ml which may have laxative effect. Galfer may make your stools darker than usual, this is normal. Galfer syrup may blacken teeth, to prevent this gargle with water after use.